activate your participation in social justice. 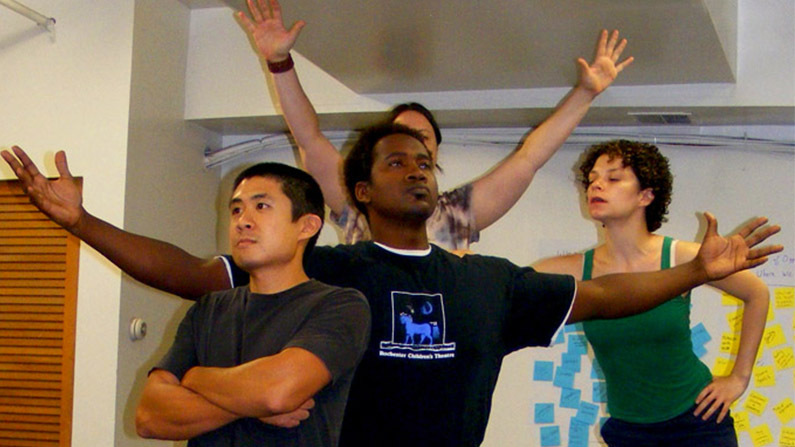 Explore Just Act’s Theatre of the Oppressed or Arts and Asset-based Community Engagement programs here . What is J.E.D.I? Justice, Equity, Diversity, and Inclusion Training. Just Act offers multi-level embodied social justice programs to strengthen citizen & collective power for healing, change & activism. Conflict is a part of life. We believe everyone benefits from having creative tools to better source from our natural intellect, reminding us of our strength, hope and ability to shed deeply-rooted patterns, flex new muscles, envision a just world, then go out and build it. With new awareness and agency, you can directly apply the practical tools gained in our workshops & programs to use in your own communities to creatively frame, explore and transform injustice. ACTIVATE your mind, body and spirit through Just Act’s Theatre of the Oppressed programs that provide an exciting entry point for sharing and interrogating real life experiences to guide the direction for change, and generating new solutions for the change you desire. ACTIVATE your passion for J.E.D.I. –justice, equity, diversity and inclusion– by gaining tools to go out into the world with a deeper understanding of our combined human experiences. We design our multi-level programming for participants to creatively recharge, and courageously explore fractured relations particularly around race, culture & socio-economic disparities through an intersectional lens. Our specialized Theatre of the Oppressed training, Forum Theatre events, customized programs and place-based Community Collaborations engage and motivate people to take new action–personally and collectively– through concrete solutions they themselves create. Witness, debate, relate, reflect and re-see difficult realities within and around you, then create transformation from the inside out. Providing a kit of creative techniques and practical strategies, Just Act supports change seekers –organizations, educators, community leaders, activists, engaged individuals—to reweave connections, nurture new understanding to embrace conflict as a place of possibility, and reimagine action plans to build a just world. 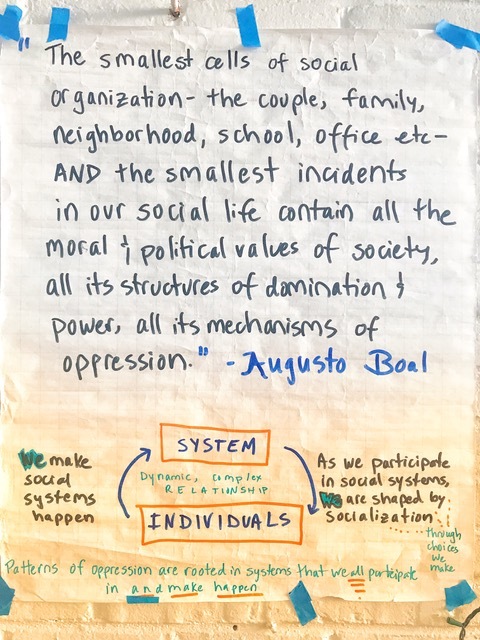 Programs are applicable to all levels of justice work committed to social action and transformation—educational, political, creative, cultural, community development and beyond. Advanced Joker Trainings by seasoned T.O. facilitator, to deepen your facilitation practice then the Just Act Institute is for you. Just Act Ensemble members collaborate with local action community groups, leaders, engaged individuals and organizations seeking new ways to tackle the struggles that surround injustice. We collectively create dynamic, interactive Forum Theatre events where participants theatrically debate real challenges and share ideas by jumping on stage and rehearsing new realities. It is our intention that community members leave energized, refreshed and empowered to create real solutions to seemingly intractable problems. Real People. Real Struggles. Real Solutions. What is J.E.D.I. Training? 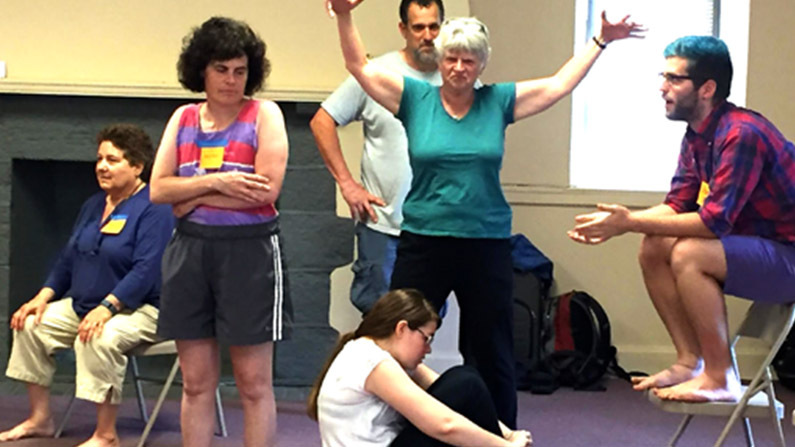 At Just Act, it means Justice, Equity, Diversity, and Inclusion training using Theatre of The Oppressed as a foundation. 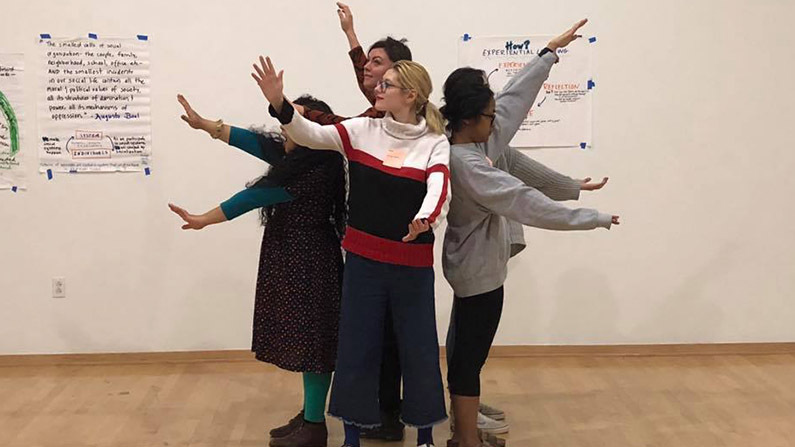 If you are looking for creative, embodied social justice training for your group or organization, Just Act’s expertise at leading groups creates lasting change. With you, we explore and identify the internal and external obstacles that get in our way & rehearse ways to use new awareness to support transformation. Using theatre and arts-based tools for exploring human interaction, imagination and community possibility in creative placemaking and community planning & visioning, Just Act customizes programs to the needs and assets of groups and organizations with whom we collaborate. 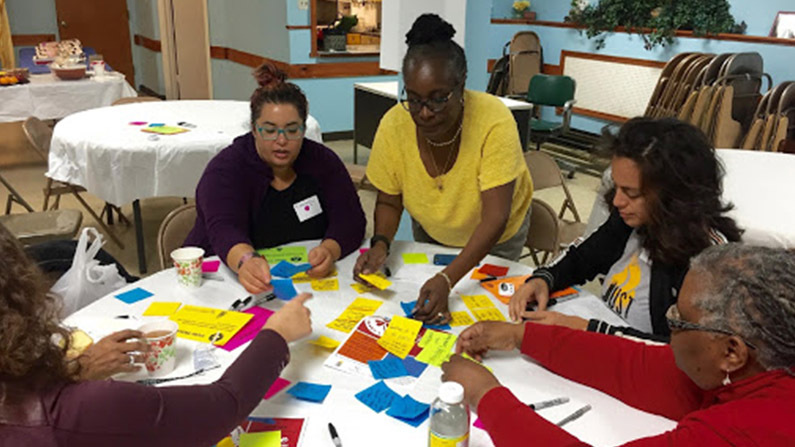 This individualized focus supports programming so that participants may witness, debate, relate, reflect upon and re-see the realities within and around them, and create action steps to transform their community into equitable, just and thriving places for all. Our place-based Community Engagement projects are designed to facilitate the capacity building and collaboration process by focusing on the unique needs and characteristics of each participating group/community. We partner with local residents, community groups and leaders to collectively develop strategies for planning and implementation of arts-based solutions that advance community growth and revitalization from the inside out (see also Related Arts and Asset-based Skill Building Workshops). The collaboration process starts with our interactions with activists, groups, organizations and schools (from 8th grade to graduate school) to identify and transform shared concerns into invigorating, interactive theatrical dialogue via Forum Theatre. Participants take this knowledge and awareness and perform their own Forum Theatre programs for their communities to strengthen strategic planning and action steps for implementing changes. 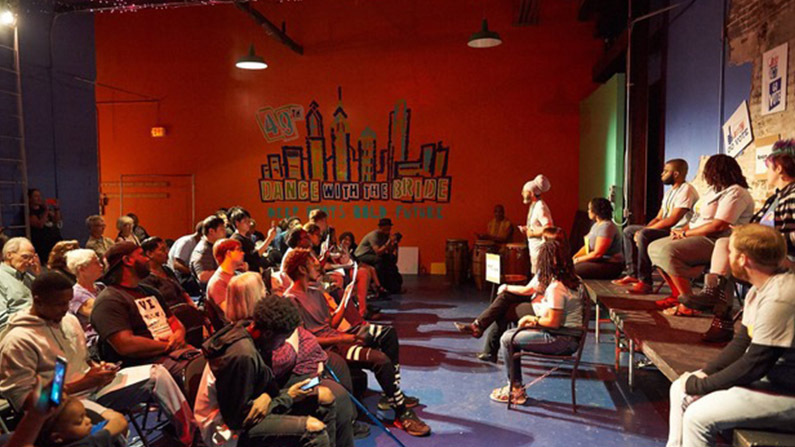 We teach constituents from partnering groups to create their own Forum Theatre piece, which serves as the centerpiece for a Forum Theatre event in their community. Just Act has taken an active role to inspire and guide local community organizations and groups to create change through collaboration. 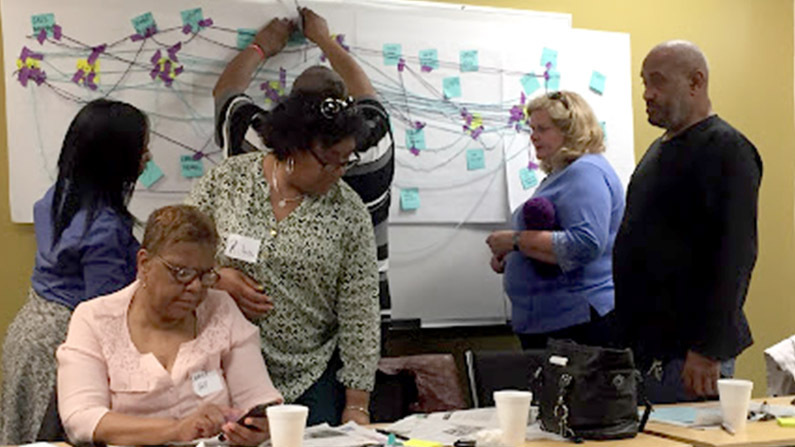 Our resident-driven community engagement model recognizes the need to identify the distinct characteristics, assets and barriers within a community that can impact the capacity and readiness to support change through new policies, projects and programs. Workshops can be customized to meet the specific needs and roles of individuals, groups, organizations and/or systems that embrace our mission as a theatre & arts-based catalyst for building relationships and networks to improve community health and well-being.